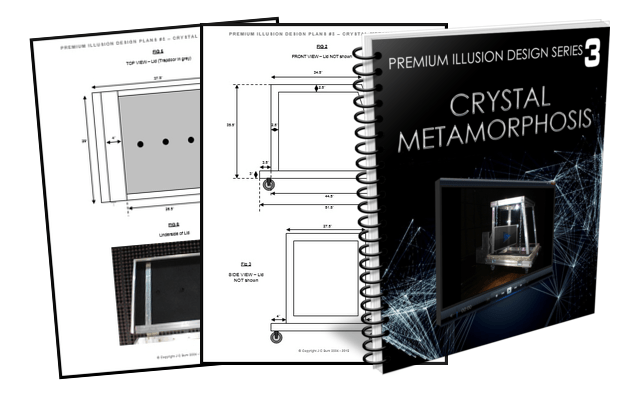 Crystal Metamorphosis is J C Sum’s original design of a crystal clear substitution trunk. It is designed for speed and every aspect of its design is functional. Crystal Metamorphosis is J C Sum’s original design of a crystal clear substitution trunk. It is designed for speed and every aspect of its design is functional. It requires one assistant and can be performed surrounded. A modern geometrically shaped transparent trunk, made entirely out of aluminum and plexi-glass, is seen on stage. The illusionist steps into the trunk and the lid of the trunk is hinged closed over him. Two thick chains secure the lid shut. His partner steps on top of the trunk and raises an all round curtain. Instantly, the curtain is dropped revealing an instant exchange of the performers. In this premium design series, J C shares his detailed building plans for the illusion prop. In his video explanation, J C highlights prop design features as well as the exact technical handling and performance of the illusion. Also included is the detailed building plans with dimensions and photographs of the illusion. Email sales@illusionbookstore.com to request for the rebate code. (Proof of purchase may be required).